What is a contemporary bedroom? Today's "contemporary" bedroom is epitomised by a philosophy of simplicity influenced by Scandinavian design, cross referencing styles and adding your own personal touch. An important distinction to make is between "contemporary" and "modern", as the two are often mistakenly used interchangeably. Modern refers to the futuristic styles of the 1920-50s, attempting to look ahead of its time, whereas a contemporary style is anything that is current, happening now and on-trend. This article will help you understand how to bring your very own contemporary style to your bedroom space—giving you tips on the current look for different parts of the room. Obviously, when redesigning a bedroom, as with a bath in a bathroom, you’re going to start with the item the room has been named after. The bed is the most important decision in dictating the overarching style of the rest of the room. In terms of creating contemporary, there is no need to stick rigidly to one style or another. In reality, you actually have a wide range of choices and styles to choose from when deciding on your dream bed. While touches of natural shades, from dark walnut finishes to dependable oak, are very popular in creating a subtle, refined tone, today’s contemporary gives you the freedom to push the boat out and incorporate lavish neutral fabrics. Whatever your contemporary identity, your furniture also has a big role to play in working with the bed to create the look and feel you’re after. Helpfully, we’ve paired our ranges together to help you in the process of creating a consistent feel. For example, our Helsinki range offers a simple, Scandinavian-inspired style characterised by quality construction and a natural, unfussy finish. Designed in a choice of either oak or walnut effect, we provide the variety to tie into a range of neutral shades. For a more glamorous contemporary style, the Paris range adds that ‘je ne sais quoi’ that brings together a family of furniture to create a sumptuous Parisian-style boudoir. Available in either white glass or mirror options, you can mix and match from anything from retro trifold mirrors to stunning dressing tables. 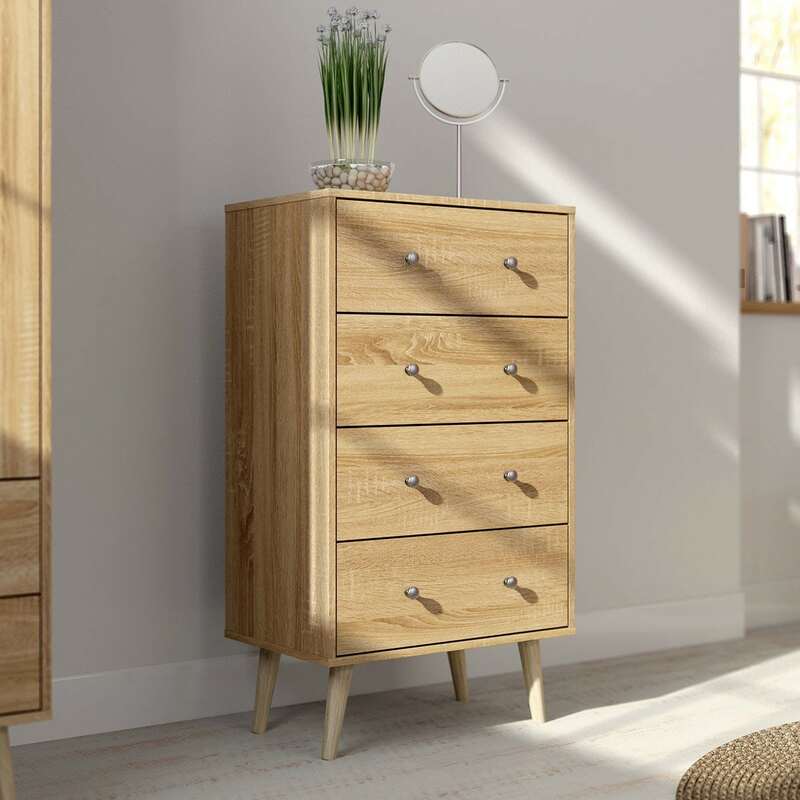 Even if you don’t want to have everything matching, you should consider all the items you might need such bedside tables, drawer chests, wardrobes and dressing tables and ensure that it fits in with your taste. Contemporary colour schemes entail a neutral base palette and then you can really go your own way with the level of personalisation and vibrancy. The colour scheme of your room will lead you down the road towards two possible style houses. If you’re going for neutral, masculine tones such as greys, charcoals or browns then you’re like to be going for what we call ‘contemporary pure’. This style encapsulates cosmopolitan sophistication and is represented in our offer by the London range. If you like a livelier palette big, bold injections of accent colours are a fantastic way of making a statement and really adding that personal touch to your space. Hot pinks and vibrant yellows are particularly popular on-trend options that lead towards what we call ‘contemporary colour’. Besides wall colour, creating contemporary is all about introducing those little personal touches. You can be imaginative with how you do this as there is plenty of room to be creative. A great way of doing this is could be a piece of geometric artwork, adding texture with a unique throw, or an extra splash of colour with a set of curtains or a rug. Essentially creating a contemporary space is about bringing your own style together with a stunning bed centrepiece, beautiful and in-keeping furniture, while adding feature details – in colour, artwork, and textiles. Be inspired and make sure you create a space that you’re ready to love. Ladies, if your decor isn't full of decorum, why not give your bedroom the feminine touch with our simple guide?